Sixth paper in ICAP’s exam course which is named C6 Financial Accounting compliments the course that students cover in Module B with the name B4 Introduction to Financial Accounting. Thus, examiner can ask anything from B4 as well. In C6 exam definitely the skill and proficiency required in interpreting and applying relevant provisions of International and local accounting standards is higher then what was expected in B4. Syllabus contains both numerical and theoretical portions and the same is reflected in the exams where examiner includes discursive questions as well with numerical ones. Students are advised to practice as much past exam questions as possible and use only such solutions which are updated according to latest examinable standards. Accounting of Tangible and Intangible Non-current assets and capitalization of borrowing cost and also Leases. Accounting for taxation of current period and how prior period’s provisions are adjusted including accounting of deferred taxation. There is no particular exam format provided by ICAP for this paper. Nothing has been mentioned regarding topics that a certain topic will form a compulsory part of the exam. Also there is no instruction about how many questions are going to be in the exam. Paper is of 100 marks in total and contains 6-10 questions divided in different parts. 50% is required to pass the exam. Access FREE ICAP – C6 video lectures exclusively available on this website. These video lectures give you all the tips, tricks and guidance to top your F7 syllabus and pass the exam with great confidence. Access FREE ICAP – C6 Revision Notes exclusively designed to memorize and grab key areas of ICAP – C6 syllabus. These ICAP C6 notes can work with any official study text book. Access FREE ICAP – C6 Practice questions. Although past exam questions of C6 Financial Accounting provides ample practice but these practice questions provide additional support for conceptual understanding and helps in every possible complication of the topic at hand. Access eX-clusive! FREE ICAP – C6 Mock Assessments. These free mock assessments enable you to check, test, stress yourself in every possible way so that you enter exam hall confident. These assessments come all such format of questions which can be found in the real exam. Learn what tips, tricks and topics you must have studied before you sit for an exam. 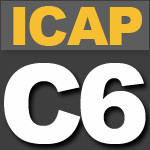 These exam guesses specifically details important areas of ICAP – C6 course.